Home > technical	> Who Dun It? Assume that the figure below faithfully represents two platform infrastructures developed by two different teams for the same application domain. Secondly, assume that both the JAD and UAS designs provide the exact same functionality to their developer users. Thirdly, assume that the JAD design was more expensive to develop (relative depth) and is more frustrating for developers to use (relative jaggy-ness) than the UAS design. Fourthly, assume that you know that an agile team created one of the platforms and a traditional team produced the other – but you don’t know which team created which platform. 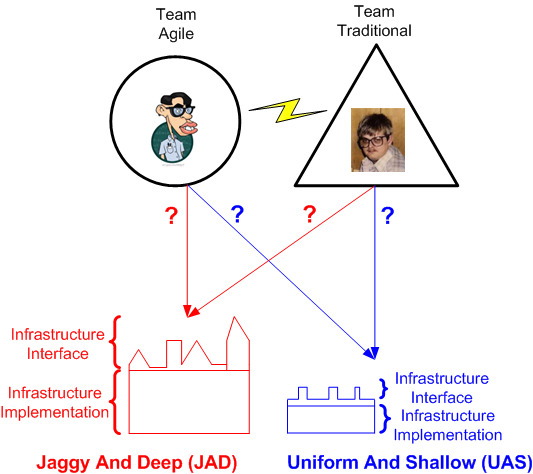 Now that our four assumptions have been espoused, can you confidently state, and make a compelling case for, which team hatched the JAD monstrosity and which team produced the elegant UAS foundation? I can’t. Based on just the information presented, I can’t say. However, given two equally experienced/talented teams (for that matter, given the same team), I’d expect the JAD design to come from the process the denigrates up front design. APIs and emergence don’t co-exist very well in my experience.